“It’s time for the younger ones to step up.” I really get tired of hearing that. Seems to me that most often when the “younger ones” have offered to help, we old ones get all condescending to them and tell them to go off and play and probably make some snide comment about their cell phones or something. So why would they come back to help? Only if they like to be used and abused by critical folks that insist on things always being the same, I’m thinking. There are lazy folks in all age groups. I’m sort of tending towards that myself these days. But, lazy butts aside, I’ve found the kids to be a real joy to work with. And they have lots of energy so when I am running on empty energy, they just keep things moving. And they often have a decent outlook on life unless you start criticizing them. Give them a deserved compliment and watch how easy they are to work with, as a rule. Cassi Jo Schriefer had called three different places and offered to volunteer. They all acted like she was an imposition. 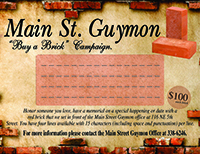 Then she came to Main Street Guymon. Katy bar the door, I’ll find stuff for this lady to do! What she really wanted to do was start a mentoring program for junior high aged girls. She and I and Teri Mora found nine fabulous young girls to be mentors. What I’m saying is that the junior high girls who get them are some lucky young ladies. This week we went to the junior high and talked to some of the girls. What fun. Six girls had turned in their permission slips the next day. Three more the next day. And the count goes up. I don’t know who is more excited … the mentors or the mentees. If you give the kids a chance, they can just bless your life over and over again. I love seeing these mentors, I love seeing their enthusiasm and their smiles. Ashlee Ortiz is probably just a normal type girl. And I really hope she doesn’t mind me sharing this. She’s college aged and a Guymon girl. Recently I have had the opportunity to have a couple of email conversations with her and I am so impressed. Ashlee read about the mentoring program and wondered if she could be a part. She asked about the program. “The mentors just want to be able to five a positive influence for the girls, help them with their homework if they need it, listen to them if they want it, and to give a few more opportunities like going to the community play. The actual mission the mentors came up with is to help instill in the young girls a sense of worth.” That is part of what I responded to Ashlee. Ashlee seems to have so many qualities a good mentor should have. As do the other ladies who have committed to this project. I am sure their mothers can tell you some of their failings … but can’t all of our mothers? And I’m laughing as I think of what my mom could tell. These are all young girls around the age of 20 – 29 or so doing the mentor program, Cassie’s Kids. You can’t tell me that our kids are all going to pot these days. I see some fabulous ones that really care here in my office. Am I lucky, or what? To have a job that includes working with people like this. It’s wonderful. So try giving some of the youngsters a chance. See how they want to do things. It can be pleasantly surprising! Cassi Jo Schriefer has taken this project from the first and carried it through. Cassi Jo, you’re an awesome young woman and I relish watching what all you accomplish. Just had to share these blessings with you.